Before I even jump into this outfit I first have to tell you, this top is sold out in white<insert ugly cry emoji here>. 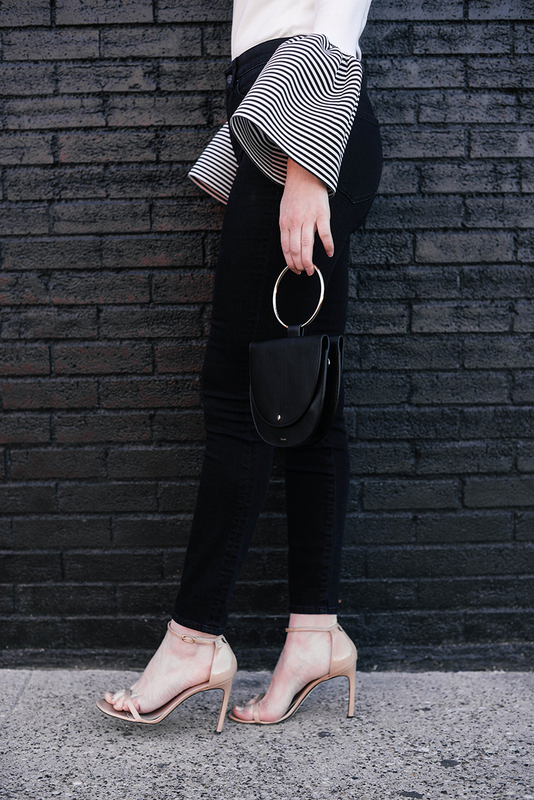 The only reason I was able to snag it is because I comb through Shopbop’s new arrivals literally daily to find great new pieces to showcase on here, and managed to grab one as soon as it hit the site. If it makes you feel any better, it was only in stock for several hours – it sold out in a snap! With that said, I’m keeping an eye on it and will let you know on SnapChat if it ever comes back in stock!! Also, this top comes in solid black that IS still available! I’ve even linked a couple of similar options from SheIn and Clu on THE SHOP under the “SnapChat” category, but both eventually sold out too. Be sure to follow along on SnapChat so you don’t miss this fabulous top if/when it does come back in stock! This Club Monaco top is off-the-shoulder, striped, and bell-sleeved. Three of my favorite things in one! If you’re a ruffle-lover like I am, check out this Sister Jane top. A solid staple that’ll elevate any casual outfit is this Roksanda top. The bell sleeves are incredible! This bow-adorned tee is just the ticket for those casual errands or other weekend activities where you want to look chic but not overdone. Too cute! Polka dots and off-the-shoulder… what’s not to love? If you’re pregnant, you need to order this top. SO DARLING! This ruffled jersey one-shoulder top would look gorgeous tucked into jeans like I’m doing above! Subtle but striking. This top is the cutest, I attended a style mafia pop up shop a few years ago. Love this look. Love this look!!! Fingers crossed the top comes back in stock! This top is so gorgeous and I love the striped cuffs!! I’m really hoping that it comes back into stock soon because it looks amazing on you! Stop! This top is so fun! Love the look girl. How fun are those sleeves? And that handbag, too. So cute! So bummed this top is sold out! It’s so cute. Can I just say you look amazing?! I love the top. 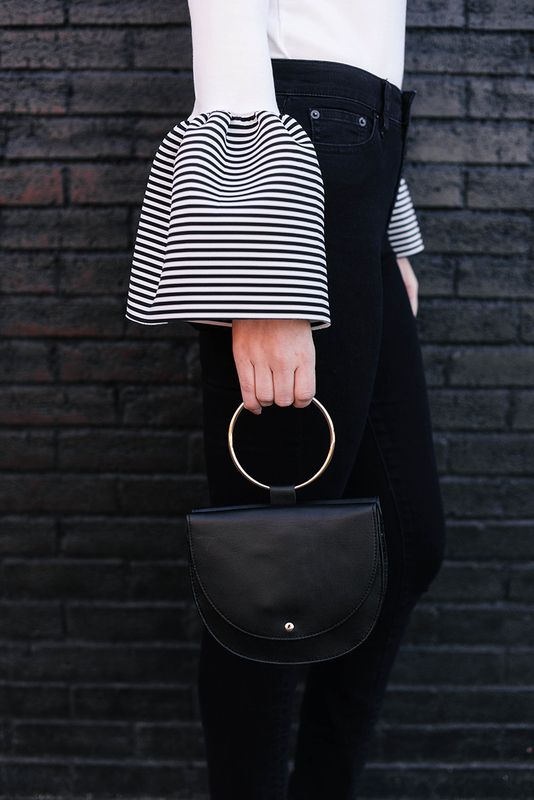 It pairs so well with your black denim. You look amazing, Merritt! Your BBG snaps and posts on cycling have definitely inspired me to get myself back into shape. I’m still kicking myself that I didn’t grab that top who it was still available, the sleeves are so good. Those sleeves are amazing…such a statement! Love how you paired them with a sleek pair of black jeans and heels. Love the top! What size are you wearing? Love the top! I’m not familiar with the brand/sizing. What size are you wearing? I’m wearing a medium! I normally wear a size six – this top is fitted all the way to the hem. I’d say it runs a little small. Just what I needed to know! Thanks. You look fabulous!